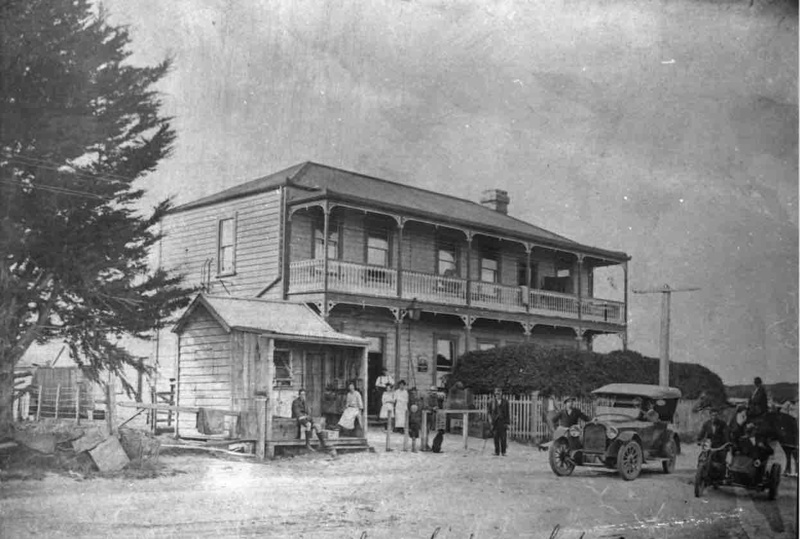 Jacob Christmann purchased the license of the Mangawai Hotel in 1906. The registered manager from 1906 to 1924 was his son-in-law Alfred Williams who married Gretchen Elizabeth Williams nee Christmann. They adopted Gretchen Elizabeth Williams, known as Bibby b. 1910. Alfred, Gretchen and Bibby are standing in the doorway of the hotel. Bibby's natural parents were May Sellwood nee Christmann and William Sellwood known as Bill. May Christmann, Rosa Christmann & Gretchen Elizabeth Williams nee Christmann were sisters. Rosa Christmann ran a shop in the small building on the left of the hotel stocking tobacco and small goods. This item was part of a collection of items from Bibby Cotter nee Williams. The collection included 14 photos and 2 autograph books.